Speaking at Meet, Plan, Go! Tim and I had the pleasure of speaking on a panel of "travel experts" last night at Boston's Meet, Plan, Go event! It was a nationwide conversation with meetings taking place in 12 other cities with a goal of not only encouraging more folks to take a career break and travel the world, but to show them it can be done! For a few seconds, Jessica disappears entirely from view. She surfaces a moment later, and I pause to fire off a few photos before plunging back into the pool myself. The water is bracingly cold on such a hot, sticky day. And it is of course just astonishingly blue. This is the most beautful place I've ever seen in my life. 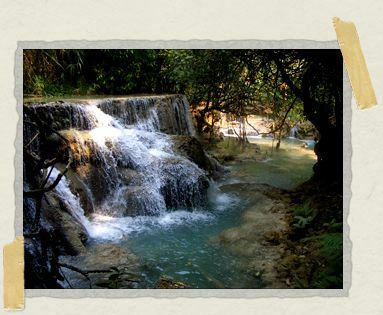 The Kouang Si Waterfalls are located about an hour and a half outside of Luang Prabang. Most people book themselves whirlwind tours that fly through here at about 3pm, giving them precious little time to see anything and absolutely no time at all to take a dip. We, rather pleasingly, did not. *Our visit here was made possible by the generous support of James McGregor. Thank you, James, so so much. It's the closest we've yet come to swimming in the pond at the cottage. The two of us (along with our new friends Bastian, Beatrice, and Sara) have booked ourselves a tuk-tuk for the day. We arrive at the park early in the morning, when exactly none of those pesky tours are here. The five of us practically have the entire place to ourselves. (Klaus, for those of you who are wondering, is back in Luang Prabang, sidelined by a killer ear infection he acquired while diving in Indonesia). There are spectacular little waterfalls beyond number here, connected together by a series of volcanic pools. The water is mountain-pure and just ridiculously packed with minerals. Those minerals lend it a luminescent blue coloring that just stops you in your tracks. 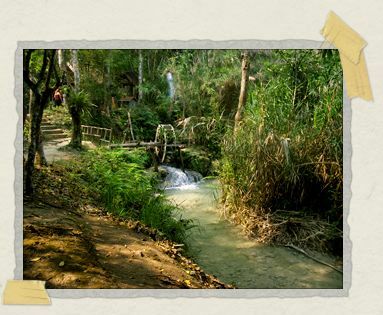 Dirt footpaths lead from one pool to the next, and networks of picturesque wooden bridges are laced above placid turqiouse pools. The pigmentation of the water pitches wildly back and forth, at times more of a milky white. There are even brief stretches where it is crystal clear, absolutely the most perfectly clear water I've ever seen. Most of the time, though, it's blue. And as opaque as orange juice. The air is hot, thick, and moist. The jungle that surrounds me in every direction is filled with melodious tropical birds, each one of them belting out an aria of glorious complexity. Sara and the Belgians have gone off to try and find the summit of the mountain, and Jessica and I are completely alone. It feels like we're exploring the surface of another planet. In the distance, above the squaking din of the songbirds, I can just hear the pounding of the big waterfall, further up the path. The falls behind and before us where we're swimming are far smaller, but still absolutely mesmerizing. I float closer to the falls behind us, smacking away a few of the larger water-bugs on my way. There's a bit of a hollow just behind the falls, which are only four or five feet tall at this point. I hoist myself up into it, and sit for a while with a waterfall pouring down onto my back. It's an invigorating little massage. Growing bolder, I next climb to the top of the falls and stand above them, the ankle-deep water rushing past me into the pool below. I walk back to the next cascade in the series, about the same size as the last, and climb to the top of it as well. From this privilaged vantage I behold an awe-inspiring sight. I am standing (nearly knee-deep, now) in a dizzying network of miniature waterfalls. Dozens and dozens of volcanic pools lay beside one another, each a foot or so higher or lower than the last, like vast array of terraces in dazzling liquid blue. There's no way to get a picture of it, because the only way to get here is to climb up those two waterfalls. Entranced, I stare at it all dumbly for a few minutes, and then gently make my way back down the waterfall. Jessica and I swim together for nearly an hour without encountering another living soul. When other people do arrive, it is none other than Sara and the Belgians, who have worked up quite a sweat from their morning's mountain-climbing. They all join us in the pool, although Sara (bless her) does pause to take a few quick photos of the two of us with our camera. The one downside to the amazing way the water looks is that you can't see the rocks beneath it. And being volcanic rocks, some of them are extremely sharp. Jessica climbs atop the waterfalls to see the field of terraced pools hidden up there. Afterwards, she begins the tricky process of negotiating herself back down the cascades into the main pool. Other than that, we report no injuries for all of our clamboring about onto, behind, and below all of the waterfalls. Bastian, mad crazy Belgian that he is, even does a cannonball into one of the pools without hurting himself in the slightest. Don't try that at home, kids. It is just such an amazing place. There's a pool where you can swing on a hanging vine, plunging from a great height into one of the deeper pools with a bit of actobatic gusto. There's the massive main waterfall, surrounded by caves and a number of viewing platforms (located at different heights). 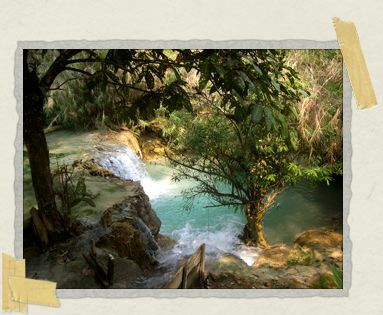 There are dozens of little rivulets and minor falls, all of them painted with the same stunning turquoise palette. And everything is cloaked in choking tropical rain forest. Trees grow out over the falls, grow behind them, even emerge from beneath them. The pools are dappled in shadow, with patches of utter blackness nestled immediately alongside expanses of brilliant sunlight. Four and a half hours after we arrived, the five of us depart for Luang Prabang. It is only an hour or two before the rush of organized tours will swoop in to overwhelm the place, and none of us want to be here to see that. Jessica and I have taken in an awful lot in the past year or so. We've been to some pretty amazing places, and seen some pretty astounding things. But I don't think I've ever seen anything quite so breathtakingly, bizarrely beautiful as the waterfalls we walked on that day. What a treat. That's the best outdoor spa I've ever seen. Number 3! Not bad, not bad at all! 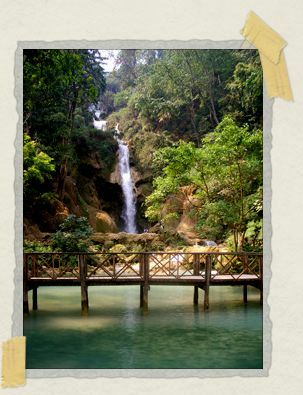 The waterfalls and blue water remind me of a family trip to Montana when I was a kid. In Glacier National Park, a good number of the rivers are fed by glaciers and the glacial dust makes them blue. I remember the blue being completely unbelievable and that pictures didn't quite convey the oddity of it. So I'm looking at your pictures and multiplying their colour and bizarreness by about six. Unreal, what a place. Looks like perfection. Thanks for the thanks guys but too much. My Hdegehog t-shirt is a hit at the gym. Wow. That place looks just…magical. i can not believe water really looks like that!